Start your day with delicious Costa coffee. You can often get cheap Costa coffee vouchers from Wowcher, Groupon, Argos, and other reputable UK retailers. Plus, with reward apps such as O2 Priority and Wuntu, you can sometimes get free coffees. Always check the Latest Deals site for new offers, deals, and discount codes. Our community of bargain hunters is always on the search for ways on how you can save money. Plus, have a read of our cheap coffee guide here. 30% off at AMAZON: Tassimo Costa Americano Coffee Pods (Total 80 Pods). Enjoy a cup of your favourite Costa coffee with cheap voucher codes here at Latest Deals! The first cup Costa coffee was poured in 1971 in the City of London. It was created by Bruno Costa and Sergio and their coffee was sold to local caterers and delicatessens. After a few years of continued success, they decided to open their own coffee shop. In 1999 they opened their first international shop in Dubai. Today, they are the fastest and probably the largest growing coffee shop chain in the United Kingdom. They continue to grow and expand their business serving people in the different parts of the world. Even though many years have passed since the making of their first cup, the taste of their coffee still remained the same. They still roast their coffee beans slowly to extract all the flavours and aroma. They also make the same quality coffee with the same roasters to produce the same output as before. Costa Coffee is a British multinational coffeehouse company. The business is a wholly owned subsidiary of Whitbread. They have over 2,121 restaurants in the United Kingdom and over 6,000 vending machines. They also have around 1,280 international outlets. Try out their coffee today to know why they are very successful. If you are looking for cheap Costa coffee travel mug, you came to the right place. 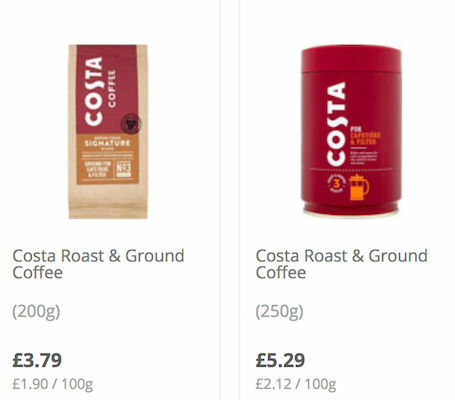 Here at Latest Deals, we will provide you with substantial information about the latest Costa UK deals, offers, and discounts. You can even use Costa mugs Tesco voucher codes and save lots of money on your purchases. 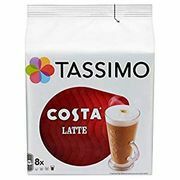 You can also purchase Costa coffee best sellers from your favourite UK retailers including Tassimo, Three Mobile, Wowcher, and Amazon. Just use the latest Costa London voucher codes upon checkout and you are good to go. There are lots of items available that you can purchase, including coffee cups, coffee mugs, saucers, coffee drinks and more. Some UK retailers are even giving away free Costa Coffee to their valued customers. Try out the different coffee blends of Costa and you will surely be satisfied. Having a cup of coffee can make your day and you can get a Free £15 Costa Coffee Voucher from JD Sports when you order items over £30. If you want to have coffee on the go, purchase a pack of Costa Vanilla Latte which you can get at Approved Food. You can get £4 off when you buy a package of 8. You can also save as much as £12.80 when you buy a Costa Cappuccino Mug at Debenhams. Drinking coffee is very satisfying when you use a cute Costa Mug which you can buy at Argos. You can get it with a £10 discount. If that is not enough you can also get a set of Costa Latte Glasses where you can save as much as £15. They also have Costa Festive Mug and Biscuit Sets which they are giving away with a £9 discount. If you are looking for a Costa Cup and Saucer Duo Set, you can also get £15 for this item. Espresso - Enjoy it with no milk. This is the ideal wake up drink to start up your day. It may look small but it is packed with a strong and intense taste that will give you a punch. Espresso Doppio – Need more kick, you will definitely have a boost in your adrenaline with the double serving of this espresso drink. Take this double shot if you cannot get enough of a single one. Ristretto – Smaller than a shot of espresso. Yes, it is true but does not underestimate this small one. It is full of flavour that will surely stimulate your taste palate. Macchiato – Perfect for relaxing in a coffee shop and just chilling with your friends. It is a mix of their famous expresso roast with a dash of milk at the top. Americano – Take this flavourful coffee straight with hot water or you can add milk for added creaminess. Flat White – This blend of coffee has a very smooth texture and is perfect for those who just want to sip a not so strong blend. Cappuccino – Perfect to be taken with your breakfast. Enjoy this Frothy, milky, chocolatey expresso anyway you want it. Caffè Latte – Try a shot of this expresso with a mixture of freshly steamed milk. Mocha – Chocolate lovers cannot get enough of it. This is an espresso topped with frothed milk and hot chocolate. Costa is proud to introduce Old Paradise Street Limited Roasts to coffee-lovers across Britain. They’ve drawn on over forty-three years of coffee expertise to bring coffee lovers a series of limited edition roasts available alongside their original Mocha Italia blend. Costa is not only popular because of their coffee, they are also famous because of their iconic takeaway cups. They made sure that their cups are being recycled to contribute greatly to lessen the effects of pollution in the world. They are the first coffee chain in the United Kingdom to practice recycling the same volume of cups that they put out in the market. They have worked with UK waste collectors and they are willing to pay them £70 for every ton of recyclable cups they collect. This will eventually double the recycling value and fewer cups will be thrown away in landfills. Not only they are helping the environment with their costa cups but they are replacing all plastic straws with non-plastic alternatives. The company is really serious about their advocacy and taking care of the environment is part of their corporate social responsibility.